Exploring Nova Scotia’s untamed Cape Breton Highlands National Park has wild rewards, writes Liz Ginis. And then he leapt, arms flapping like rotor blades, off the 20-metre cliff and into the foaming sea below. It seemed an eternity before his head popped, cork-like, out of the brine, and the breath I’d been holding was finally granted its exit. Cape Breton Highlands National Park, on the northern tip of Canada’s island province of Nova Scotia, is no place for the faint-hearted. It’s a wild concoction of spectacular scenery – vertigo-inducing highlands, Tolkien-esque river canyons and craggy cliffs that plunge (like Kent) into the icy sea. I’d come halfway around the world to explore this earth’s-end landscape, on trails that snake along exposed mountain tops, through peat bogs and into coastal fishing villages, complete with centuries-old lighthouses that, it seems, time has mislaid. And then there’s the wildlife. Moose roam free here, and spotting them can be nigh on impossible or ridiculously easy – I saw two ‘hiding’ in a sapling forest a stone’s throw from a perfectly groomed golf course (Highland Links – yep, there’s sophistication amid the wilderness). I’d spent the two days before that trekking up hill and down dale, and mired in peat bogs following moose tracks that afforded me not even a glimpse of an antler. Still, hiking boots covered in muck and legs stinging from the unrelenting exertion, it was worth every step. Close encounters with pilot and humpback whales are second to none in the cool waters of the Gulf of St Lawrence. Access to the park is via the Cabot Trail, without doubt one of the world’s most scenic drives and a favourite with motorcyclists. It’s 300 kilometres of smooth, bitumen road that hugs the rugged coastline and skirts a seemingly endless azure sea (the Gulf of St Lawrence on the north-western edge of the island, and the Atlantic Ocean in the east). Heading inland, it wends through spectacular Canadian maple forests that morph from lime green in summer to waves of red, orange and brilliant yellow come autumn. The 9.2-kilometre Skyline Trail is one of the most popular tracks in the park, and loops atop an impressive coastal headland. I followed a grassy path through fir trees and over roots and rocks to a bog surrounded by sweetly scented pines and earthy peat moss. There were moose tracks everywhere. Promising, Kent, promising. As I walked west towards the coast, the forest thinned to reveal expansive views of the sea. It was spectacular; the frothing waves of the Gulf of St Lawrence – the world’s largest estuary and the outlet of the Great Lakes of North America – lapped at the horizon. Roughly halfway along the track I joined a boardwalk that traced the spine of the mountain. The panorama was sublime: to my left, row upon row of pine-clad peaks, and to my right, nothing but deep blue sea. At the boardwalk’s end – a viewing platform at the edge of the cliff – I pulled off my pack and sat, watching the waves roll and roll and roll. Amazingly, I spotted a pod of long-finned pilot whales not too far offshore, flukes slapping on the surface (a practice known as lobtailing). Difficult as it was to drag myself away from such beauty, back on the Skyline loop I became immersed in the plant life – the pines were stunted from years of being lashed by wind and the peat bogs were a drawcard for all manner of animals, from the snowshoe hare and white-tailed deer to the black bear. I’d stopped to check out a golden dragonfly hovering over a pitcher plant when I heard the press of heavy hooves on soil and looked up to see a moose. It was a male, with antlers as wide as he was long. He took one look at me and ambled away. Breathtaking. The park is littered with walking tracks like this – scenically stunning and not too hard on the heart. But if you’re looking for one that really gets the blood pumping, try Franey, a steep 7.4-kilometre loop to the 425-metre peak of craggy Franey Mountain. From here the 360-degree view takes in the impressive Clyburn River Canyon, which cuts a path eastward to the Atlantic Ocean. For moose spotters, the three-kilometre Benjie’s Lake trail is most likely to deliver the goods, while beaver lovers should tackle the 1.7-kilometre Freshwater Lake trail, on the southeast edge of the park. In total, Cape Breton Highlands National Park has 26 designated hiking and mountain-biking trails, as well as eight campgrounds. It’s a wildlife haven, and tucked up in my tent at night I’d hear the forest rustle with movement. A moose? A bear? A cheeky lynx trying to sniff out treats from my dillybag, which was hidden away in a nearby bear-proof food locker? There are also sleepy coastal villages in which you can rest your weary bones (away from the wildlife) and soak up the island’s rich maritime and Scottish heritage. Scots first came to the island in the 1770s, and today it’s home to the largest Gaelic community outside Scotland, which continues many fine traditions from the homeland, including Celtic fiddling, step-dancing and producing the best melt-in-your-mouth shortbread I’ve ever eaten. Drizzled with the ubiquitous Canadian maple syrup, it’s fuel for all-day adventuring. The towns of Inverness on the west coast and Baddeck on the east both brim with Gaelic-inspired food and culture, and in homes, restaurants, pubs and community halls, céilidhs raise the roof pretty much every weekend. Informal social gatherings featuring Scottish dancing, music and storytelling, they’re as much a part of the fabric of the island as the word ‘eh’ is to Canada as a whole. Weathered fishing shacks stud the wind-lashed coastline of Cape Breton. Towering Canadian pines meet a tumble of boulders in Cape Breton Highlands National Park. After a week in the wilderness I stopped in Baddeck to sample a local delicacy pulled straight from the sea. “So what is planked salmon?” I asked of my host at Baddeck Lobster Suppers. While my friends dug into steaming bowls of seafood chowder then a bucket of freshly steamed mussels followed by lobster (a steal at roughly $22 per kilogram, compared to $65 in Australia), I watched as my thick fillet of salmon was laid on a plank of timber in an outdoor cooking hut 15 metres away and drizzled in maple syrup over and over again, before being skilfully squeezed between two grill plates and sizzled over hardwood coals. It was well worth the wait; the sweet and fishy flavours danced a delicious jig in my mouth. Renowned for its music, Baddeck is equally celebrated as the beloved home of inventor extraordinaire Alexander Graham Bell. Born and raised in Edinburgh and most famous for inventing the telephone, Bell moved to Baddeck with his family in 1885, looking for “a place of salt water, mountains and valleys” where he and his wife Mabel could “put [our] little girls in trousers and live a simple, free and unconventional life”. Located in Baddeck, the Alexander Graham Bell Museum, a national historic site, is an intriguing place. Bell was a prolific inventor (according to one of his biographers his work ranged “unfettered across the scientific landscape”), and his countless creations are on show here, from a metal jacket used to assist in breathing (a precursor to the iron lung) to a device for locating icebergs. There are also composting toilets, air-conditioning units and the biplane Silver Dart, which, in 1909, made the first powered flight in the British Empire. It took off from the ice-covered waters of Bras d’Or Lake, over which the museum presides. His ever-enquiring mind and appreciation for the raw beauty of nature allowed Bell to see the value in a geographic journal of record, and in 1888 he became one of the founding members of the National Geographic Society. Kent, the moose and I couldn’t agree more. 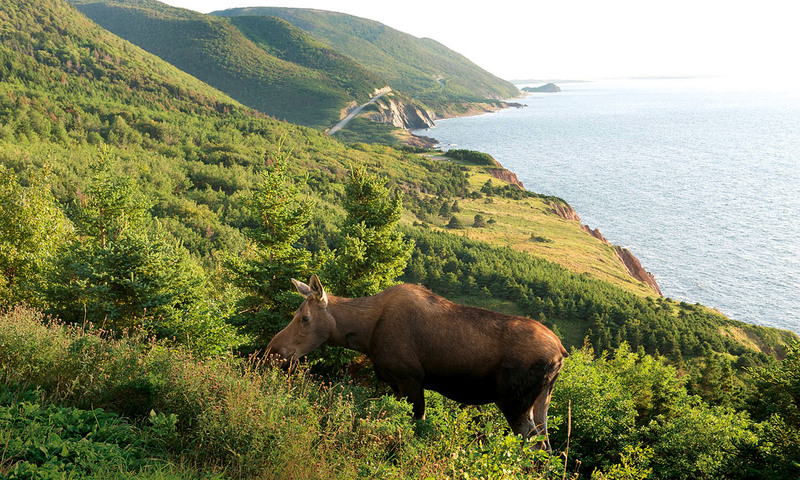 Air Canada flies from Sydney to Vancouver direct with onward connections to Halifax, an hour’s drive to the south of Cape Breton Highlands National Park. Car hire is available at Halifax airport. Cabot Links has spectacular accommodation set on the sprawling hills beside the waters of the Gulf of St Lawrence. Open from mid-April to mid-November. Keltic Lodge Resort and Spa is perched atop a headland with impressive views over the Atlantic Ocean. Originally built in 1850, Inverary on Baddeck Bay is set on 4.5 hectares on the shores of Cape Breton’s Bras d’Or Lake. It’s open year round, with limited food service from November to April. Find out more about Canadian National Parks on the Parks Canada website.